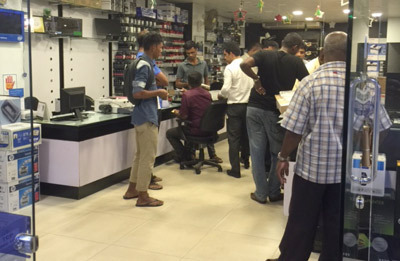 Computers dealers at Unity Plaza, Bambalapitiya were caught by Enforcement Officers from the Colombo Crimes Division ("CCD") for selling notebook computers (or PCs) installed with suspected pirated software to innocent and unsuspecting consumers. The raids were carried out under the direction of DIG Colombo; Gamini Mathurata; Director CCD; ASP Nuwan Vedasingha and Chief Inspector of CCD; Mewan Silva with IP Ranasinghe, IP Deepal and IP S. I. Pieris and team executing the raids. ASP Ruwan Gunasekera; Media Spokesmen for the Sri Lanka Police said "Raids of this nature are not a daily occurrence in our country but it does not in any way mean that enforcement officers are not vigilant against acts of software piracy in the PC retail market. In fact, this multiple raid at Unity Plaza should act as a reminder to everyone that they are constantly under watch. Computer dealers have a responsibility to their customers, many of who are ordinary consumers that are not IT-savvy. These raids are not only necessary to protect the interest of unsuspecting consumers who would have ended up being cheated by these unscrupulous businesses with illegal content, but also to safeguard consumers from the looming risk of cyber-attacks and digital risk. According to a study conducted by IDC-NUS in 2014, it was found that 61% of news PCs sold with pirated software come infected with malware. The malware included viruses, worms, Trojan horses, rootkits, and unwanted Adware, which had pre-infected the new PCs before they could even access the Internet. There were other problems as well, such as misleading applications, corrupted executables, exploits, and system vulnerabilities. "Consumers buying a new computer simply want their PCs to function in a safe manner. A PC with pirated software and possible malware puts families, children at risk. For the computer dealers caught in this weekend's raids, this will definitely be a hard taught lesson as they and their companies will be charged under the Intellectual Property Rights Act No. 36 of 2003 which carries heavy fines and jail sentences if they are found guilty of any copyright infringements, in a court of law" added ASP Gunasekera. The Media Spokesman reaffirmed the government's continued commitment to intellectual property rights protection and warned businesses against flouting the law. He furthered, "The copyright laws in Sri Lanka are very comprehensive, carrying both criminal as well as civil offenses. Any business found guilty of possessing, other than for private and domestic use, infringing copies of computer programs, the company and its director/s will be held liable. The actions of computer dealers installing pirated software may also directly contribute to an increase in cyber security incidents in the country, as cyber criminals have become more sophisticated in their attempts to infiltrate computer systems; one method of inserting malware into computers is by planting them in pirated software. As part of the investigations, technical experts will also examine the computers seized for embedded malware and botnets". Sudath Perera, leading counsel on intellectual property rights protection and legal Representative for many global brands said, "it is vital that the intellectual property rights of brand owners are protected to attract potential investors and international brands to invest in Sri Lanka, whilst consumer protection is of paramount importance today in the context of cyber security and online safety." The Media Spokesman said, "We urge consumers to be vigilant against unethical computer dealers who offer a deal too good to be true. The risks to consumers and businesses are real, as it is no longer just about respecting creative rights of others anymore, it is also about your own privacy and safety. Say no to piracy and insist on a true computing experience that can only be delivered with genuine and updated software and safe online practices," he added.